SketchUp makes 3D drawing a cinch for architecture, engineering, and construction professionals. With a range of easy and intuitive controls, SketchUp offers AEC professionals a way to transform 2D sketches into detailed 3D models. The best way to optimize this essential software is with a BOXX SketchUp workstation. The acclaimed SketchUp has gained widespread use in designing architecture, construction, and engineering projects. With a number of other applications (cinematic and video game modeling), SketchUp markets itself as offering all the functionality AEC professionals need, while sacrificing none of the usability required to make designing a painless process. Primary workflows include surface creation and manipulation, as well as 3D object rendering, as the software hosts a library of prefab items users can place in their own models. However, even with simple controls, users still must consider the best workstation for SketchUp, i.e., which configurations will enable peak performance. When AEC professionals need to render 3D models in SketchUp, they have a list of add-ons and extensions from which to choose. These options include V-Ray and Octane Render, but each rendering plugin may require different specs, as V-Ray can take advantage of CPUs or GPUs, while Octane only uses GPUs. AEC professionals can solve this dilemma by choosing a BOXX SketchUp rendering solution. For CPU rendering, configurations are available with up to 56 cores while local GPU rendering solutions can accommodate up to four GPUs in a single workstation tower. Named Sections allow easy access and management. Filled Section Cuts let you select a color and bake them into templates. Fast Sections improve performance for models that use section planes to hide extensive geometry. Scaled Vector Drawing lets you add linework that’s not in your model. DWG Import allows you to import a DWG into LayOut and find illustrations scaled to paper size. Draw better with inferencing, chamfering & filleting, arcs, offset arrays, and selections. Advanced Attribute fields embed component price, size, URL, type, status, and owner. Aggregated Reports enable configuration of component data reports to sum parts and quantities for schedules and cut lists—or to create detailed estimates. IFC Import/Export allows you to move information freely between applications. In just a few short steps, SketchUp allows AEC users to transform a single line into a box with custom depth. With functions like push and pull, line weight adjusting, and dimension altering, SketchUp offers users precise tools for detailed design and modeling of any project, whether grand cityscapes or small, intricate assemblies. Selecting your SketchUp workstation is critical because supporting these workflows should be as easy and functional as possible. The first thing AEC professionals should know is that SketchUp is a frequency-bound application (the dominant variable in determining performance). The number of CPU cores in your workstation is less important than the frequency of the single core that SketchUp uses. 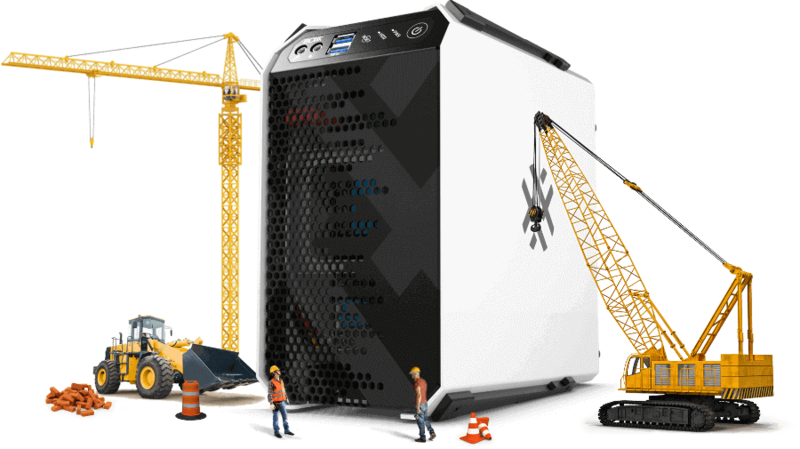 To address this need, BOXX professionally overclocks our SketchUp workstations like the 5.1GHz APEXX S3 to deliver increased frequency that maximizes the application’s performance. AEC professionals are naturally on-the-go. Whether they're visiting a site, traveling to make a presentation to stakeholders, or working away from a desk, these users need a mobile SketchUp laptop that is configured to enable them the full capability and support they'd expect from the best PC for SketchUp. Not every mobile option can utilize large data sets and SketchUp applications like our GoBOXX mobile workstations. For example, our GoBOXX MXL, featuring an Intel® Core™ i7 (3.7GHz), 64GB of RAM, and high-end NVIDIA graphics, is a true SketchUp desktop replacement.